On Monday, March 1, 2010 I started an internet based firm to provide state and local tax consulting both inside and outside of Michigan. Edward S. Kisscorni, CPA/MBA is the owner of an web based, paperless, green firm specializing in Michigan State and Local Tax consulting with a special emphasis on state tax audits and appeals. His firm operates from offices located in the Federal Square Building in downtown Grand Rapids. Ed has extensive experience in Michigan state and local taxation first as an auditor with the Michigan Department of Treasury, in the tax department of an international accounting firm, as a sole practitioner, and leading the state and local tax groups of a large local accounting firm and a national accounting firm. Ed Kisscorni is the most recognizable speaker in Michigan on State and Local Tax issues including the Michigan Business Tax. He has presented Single Business Tax, Michigan Business Tax and Sales and Use Tax seminars for over twenty-five years for the Michigan Association of Certified Public Accountants (MACPA) and is a frequent speaker at conferences and workshops. He has also spoken extensively for the Michigan State Chamber of Commerce and other business groups. 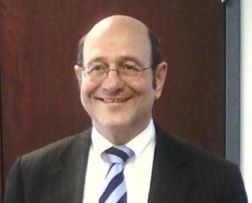 Ed Kisscorni has published many articles on State and Local Tax during his career and in 2006 he co-authored the book MICHIGAN BUSINESS TAXES - An Employers Guide to the Single Business Tax, Sales and Use Tax and Property Taxes. In May of 2008, The Michigan Business Tax Desktop Reference Manual was released. The 2009 edition was published along with The Control Test for a Michigan Business Tax Unitary Business Group. The 2010 edition of The Michigan Business Tax Desktop Reference Manual is currently available. Ed Kisscorni has been actively involved and served in leadership positions on the tax committees of the Grand Rapids Chamber of Commerce and the Michigan State Chamber of Commerce. He served six years on the Board of Directors of the Grand Rapids Chamber of Commerce. In addition, Ed has been involved with local, state and national professional associations. Currently he is completing his sixth year on the Board of Directors of the MACPA. Ed Kisscorni served three different governors in his eighteen years on the Administrative Committee on Public Accountancy and the Michigan State Board of Accountancy, the last four as Chair. He has frequently testified before legislative bodies on matters of taxation. Ed's practice areas include Consultation and Planning in Michigan State and Local Taxation. He specializes in Audits and Appeals of Michigan State and Local Taxes.